Today Kayleah and I sang our very first duet in Sacrament meeting. We sang 'Teacher Do You Love Me?' from the Primary songbook. She did such a good job! I was so impressed with her. Many people in the Ward came up to her during church to tell her how well she did. Kayleah didn't quite know what to say or how to respond. :) For the first time she was a bit shy and somewhat speachless! I am constantly impressed with the many talents my children have. They are all so gifted. Of course I'm glad that they all like to sing, some more than others ;). Music fills our home daily and that fills my heart. I love that song. 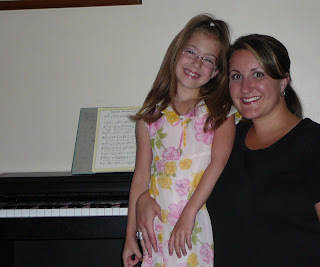 Did your daughter inherit your beautiful voice? By the way, you look great in this picture! awww how sweet. I would have loved to hear you sing. I was always so jealous of your beautiful voice. I remember you sang at a missionary farewell and it brought me to tears. what a neat experience for you to sing with your daugther! lylas!!! I consider myself lucky because I was able to hear you guys first hand and it was AMAZING!! Kayleah sang with confidence and sang like a pro just like her mother! !Your kids have so many of your wonderful traits and talents--no wonder they are so great!!! Can we get free tickets when you both are famous and singing on tour? Love ya!